Today many businessmen argue that a university degree is a necessity to succeed in the business world. The following figures, however, have shown that this is not the case. They’re some of the world’s most successful business leaders thanks to their creativity, determination, and passion for what they do. Bill Gates has been the world’s wealthiest man for 13 years in a row. However, he doesn’t have a degree. He dropped out of Harvard in order to focus on developing his company. Today Microsoft is one of the most influential companies in the world. Sir Richard Branson is the owner and founder of the Virgin Group. He was interested in becoming an entrepreneur from a young age, and dropped out of school when he was 16 to start Student Magazine, the first of his many business ventures. Henry Ford, the automobile industry leader, was one of history’s richest men. Surprisingly, he was born into poverty and never attended school. Despite this, he went on to create Ford Motor Company. Pete Cashmore founded Mashable, a popular digital media website, when he was 19. He never attended college, but has gone on to become extremely successful. He’s now worth £60million. Charles Culpepper was the founder and CEO of Coca-Cola. He dropped out of high school, but he went on to create one of the most recognised brands in the world. Ray Kroc was another historical businessman who proved that you don’t need a degree to succeed. He never went to school, but he’s the individual responsible for turning McDonald’s into the multi-billion dollar and globally recognised company that it is today. Mark Zuckerberg is one of the most famous names in tech. He dropped out of college at Harvard, and co-founded Facebook. He’s responsible for turning it into the world’s largest social network. Today he is worth $62.3 billion. Simon Cowell is a musical millionaire. He’s one of the most influential businessmen in the industry. He dropped out of school when he was just 16, and started Fanfare, his record label, when he was 23. Today he’s worth £300 million. 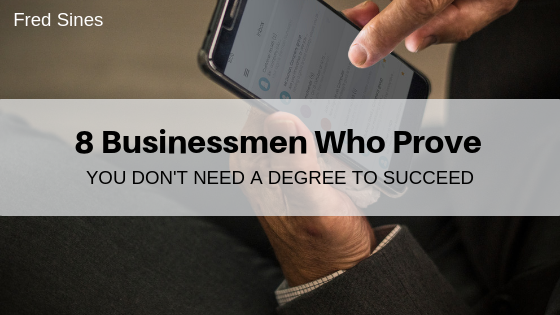 These industry leaders prove that you don’t have to have a university degree in order to succeed in business. They’ve founded their own businesses, owned some of the world’s most influential groups, and created new technologies.